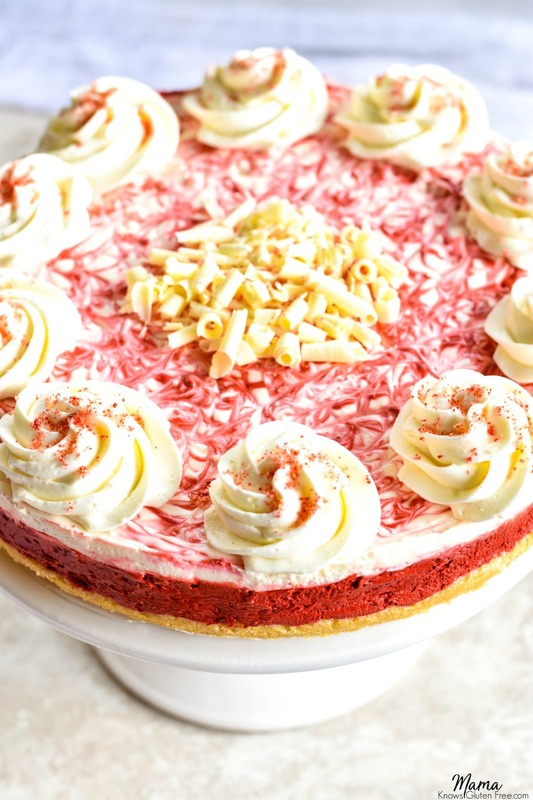 Gluten-Free Red Velvet No-Bake Cheesecake is a lusciously layered dessert. It has the decadent flavor of traditional cheesecake, without all of the fuss. Red velvet cake is a staple on holiday tables across the South, but this year I decided to make it with a twist. I love cheesecake, but I don’t love how time-consuming it is to make. That’s why I love to make gluten-free no-bake cheesecakes. It has the decadent flavor of traditional cheesecake, without all of the fuss. 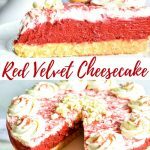 If you are looking for the perfect dessert to serve at your holiday party or to your family on Christmas day, you cannot go wrong with this easy to make no-bake gluten-free red velvet cheesecake! 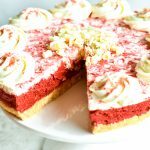 Thank you to Schär for partnering with Mama Knows Gluten Free for this gluten-free Red Velvet No-Bake Cheesecake recipe. I decided not to do a traditional graham cracker crust, but choose to use Schär’s Gluten-Free Butter Cookies. Schär’s butter cookies are perfect for this recipe. They made a fantastic crust because of their rich and buttery flavor. 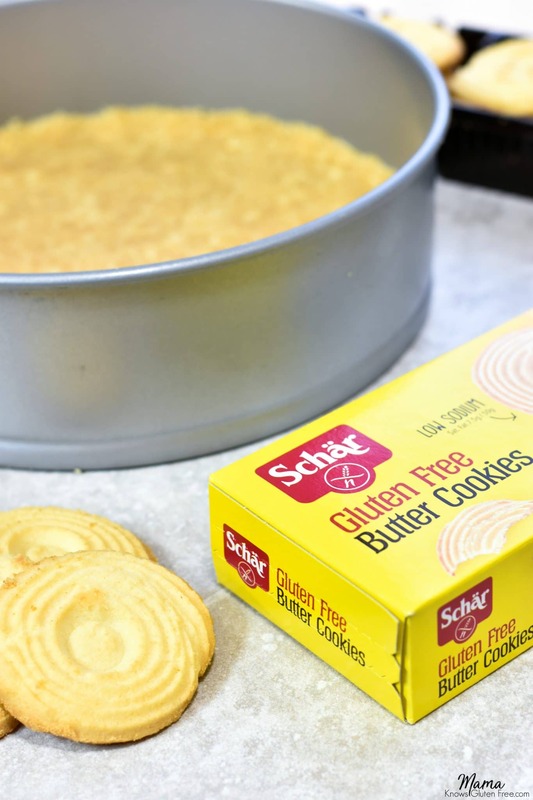 Not only are Schär’s butter cookies certified gluten-free but they are also Non-GMO and preservative free. I absolutely love Schär gluten-free products and I know why they are Europe’s number one gluten-free company! They have everything from certified gluten-free bread, rolls, pizza crust, cookies, crackers and snacks. The best thing about Schär is not just their wide variety of gluten-free products, but that their products taste amazing! I also love that I can easily find their products at my local Walmart, grocery stores and on Amazon. This luscious gluten-free dessert has two layers of creamy cheesecake filling. One layer is the traditional cheesecake flavor and the second layer is dreamy red velvet. This no-bake gluten-free cheesecake perfectly mimics the flavor of a traditional red velvet cake with cream cheese frosting. It’s the best of both worlds! This is definitely a show-stopping dessert. I promise it will be the first thing that goes at the holiday dessert table. Cheesecake is always a crowd pleaser, and this gluten-free version will prove to be a favorite. No one will even know that it’s gluten-free. I also have two other gluten-free no-bake cheesecake recipe. Crush Schär Gluten-Free Butter Cookies in a food processor or by hand, until you have 3 cups of fine cookie crumbs. Pour the cookie crumbs into a medium-sized bowl. Pour the melted butter into the cookie crumbs and mix until fully combined. Line a round 9-inch spring-form pan with parchment paper. Press cookie crumb mixture evenly into the bottom of the lined spring-form pan. You can use the back of a measuring cup to help press the cookies crumbs down firmly. Cover and refrigerate while making the cheesecake filling. Pour the gelatine into a small bowl and add boiling water. Keep stirring until the gelatine is completely dissolved. In a large mixing bowl beat the cream cheese and powdered sugar together until smooth. Add the sour cream and pure vanilla extract and mix until fully combined. Pour the gelatine into the cream cheese mixture and mix until fully combined. Add the heavy whipping cream and mix until fully combined and mixture thickens. In a medium-sized bowl, melt the chocolate chips in the microwave at 15-second increments, stirring after every 15 seconds until fully combined. Chocolate chips can also be melted in a small saucepan on the stove. Add the red food coloring to the chocolate cheesecake mixture until fully combined. The cheesecake filling will turn really red. Remove the crust from the refrigerator and spoon in the red velvet cheesecake filling to create the bottom layer. Smooth the top with a spatula or the back of a large spoon. 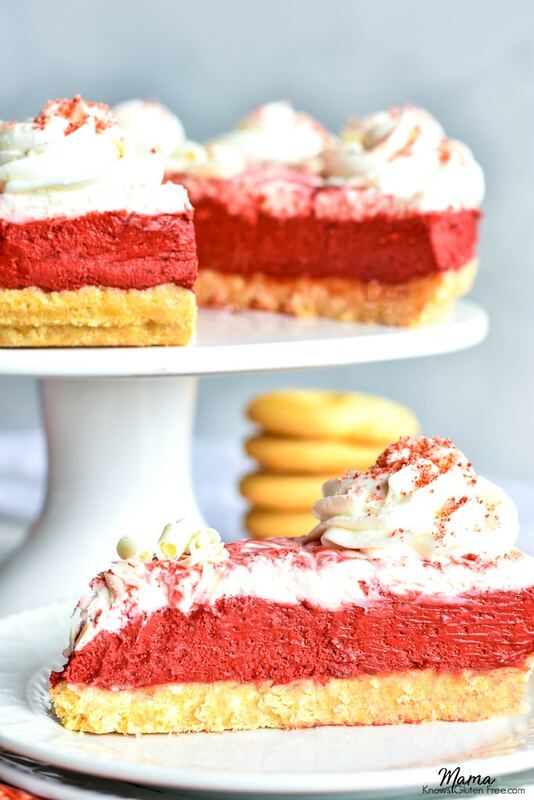 Spoon the white cream cheese filling over the top of the red velvet cheesecake filling. Smooth the top with a spatula or the back of a large spoon. 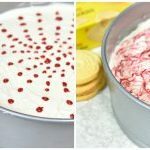 To create the swirl design, use a toothpick to drop little dots of the red velvet cheesecake filling (with the additional red food coloring mixed in) in a circular pattern. Start by making the drops from the outside of the cake and work your way to the center of the cake. Using a toothpick create a swirl pattern by dragging the toothpick through the red dots. See the example below. Cover cheesecake with plastic wrap and refrigerate until firm (about 3 hours). You can put it in the freezer to speed up. Once the cheesecake is set, run a knife under hot water, and then along the edge of the springform pan to create a small gap between the pan and the filling before carefully unmolding the cake. Top with whipped cream before serving. I also added white chocolate curls. this is SO fantastic! 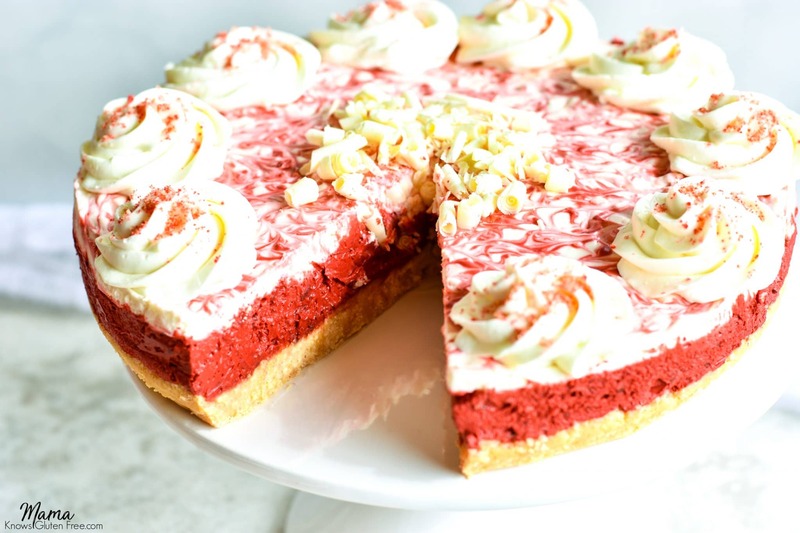 I love the butter cookie crust, and anything red velvet! Thank you so much! The Schär cookie crust is perfect for the no-bake cheesecake. It makes it so easy. Schar butter cookies are so good! Love how this is no bake! They make an amazing crust that is super easy to make! What a stunning cake Audrey! And such a brilliant idea the way you layered the flavors on. Thank you Alisa! I love the cream cheese frosting a red velvet cake so I thought it would be great to have both flavors in the cheesecake. This looks so decadent and delicious!! This cheesecake looks spectacular! Love the way you incorporated the different flavors. HI Kristin! Thank you so much! I love how red velvet cake has a cream cheese frosting, so I wanted the cheesecake to have the same flavor combination. This is a gorgeous cake for the holidays. I love the color. That looks perfectly thick and creamy! YUM!